Chronic patellar rupture is very rare injury. In healthy individuals the rupture is usually caused by direct trauma as seen in the setting of recreational sports [1,2]. Although it is easy is to diagnose but difficult to treat with limited described procedures to treat that to with poor functional results. 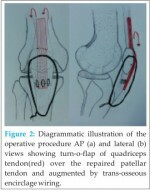 We report a case a 10 months old neglected patellar injury in a leprotic patients repaired with end to end approximation and doubly augmenting it firstly with transosseous wire between patella and tibial tuberosity and further augmented by turn o flap of quadriceps over the repair, having excellent results after 2 years of follow up. 61 years old male presented with decreased range of movement arc of left knee joint and inability to run. He had history of trauma to left knee joint following dog bite 10 months ago. Initially he was treated elsewhere with anti-rabies treatment, antibiotics and analgesics following which wound healed uneventful. Patient also had history of healed leprosy. On clinical examination, a 6cm obliquely placed old healed scar due to bog bite injury, was present at the left infra-patellar area of knee. A palpable gap was present at the infra-patellar area with lack of normal patellar tendon continuity between patella & tibial tuberosity in both extension & flexion. There was no local tenderness, effusion or synovial thickening. The range of movement of knee was 200 to 1350 with extension lag of 200 with patella palpated high up in suprapatellar pouch. Q angle was normal. His hematological investigation including haemogram, ESR, serum calcium, phosphate, alkaline phosphatase, RA factor, uric acid, KFT were within normal limits. On radiological examination, there was patella alta with loss of soft tissue shadows of continuity of patellar tendon in anterio-posterior and lateral films. Insall salvati index was 0.55 confirming diagnosis of patella alta. A diagnosis of 10 month’s old neglected rupture of patellar tendon with patella alta was made (Fig 1). Patient was treated surgically in supine position and the patella and patellar tendon exposed via middle approach. On exposure patellar tendon was found ruptured in the mid substance only. The ends of the ruptured patellar tendon were freshened and the dense fibrous tissue was released both proximally and distally. The patella could be pulled down. Repair of patellar tendon was done with non-absorbable suture, taking care of the patellar tendon length and augmented with a turn-o-flap of quadriceps tendon of around 8 cm x 3 cm strip over the repaired patellar tendon. This repair was further augmented with an S-S wire passed trans-osseous between patella & a 3.5 mm cortical screw post over tibial tuberosity (Fig 2 and 3). Post operatively patient was immobilized in cylindrical cast in full extension for 6 weeks. During the immobilization period, weight bearing as tolerated was allowed and quadriceps exercises with straight-leg raises in the cast were performed. After 6 weeks cast was removed and gradual knee flexion & extension exercises started. At 24 months follow up patient has full range of motion of knee with 00 – 1350 with no extension lag with insall salvati index of 0.8 without implant breakage (Fig 4). Patellar tendon rupture, is usually caused by direct trauma as seen in the setting of recreational basketball, volleyball, and other jumping sports. The risk of rupture of a patella tendon increases greatly in elderly with presence a systemic disease in which collagen structure weakens like systemic lupus erythematosus, rheumatoid arthritis, diabetes mellitus or long term corticosteroid therapy which needs to be investigated further . Kannus and Jozsa, noted that 97% of patella tendon ruptures had pathologic changes like hypoxic tendinopathy, mucoid degeneration, or calcification . Delayed or neglected cases are mainly due to misdiagnosis, reluctant to initial treatment or primary treatment with bone setters. When the neglected patellar tendon injury reports after 6 weeks, the attainment full range of motion, improve quadriceps strength, obtaining anatomic patellar alignment and restoring functions becomes difficulty due to scar formation, atrophy and contracture of the quadriceps, poor quality to remaining reabsorbed tendon, inadequate soft tissue, proximal patellar migration and prolonged post operative immobilization [1-3]. Rupture is diagnosed easily when active extension is absent but sometimes overlooked when patient is able to extend knee actively. Radiographic figures reveal a high riding patella, with loss of normal soft tissue shadows of the patellar tendon and a decreased insall-salvati index. Ultrasound and MRI have been shown to be useful in identifying both acute and chronic ruptures but a good history and physical examination, and plain x-rays are usually sufficient to make the diagnosis [1,3]. There is no role for conservative treatment and outcome of surgical repair are best, if repair done in less than one week of injury. Siwek and Rao reported 80% excellent and 16% good outcomes in patients treated with primary repair within 7 days of injury whereas results declined in patients treated 2 weeks or more after injury having only 33% excellent and 50% good results. Neglected rupture which is severely disabling injury, is more technically demanding to repair with invariably poor functional outcome of which mid-substance tear is the most difficult to repair, and more so the strength of repair at mid-substance is compromised due to poor quality of tendon tissue due to associated with medical conditions. But fortunately most patella tendons ruptures occur at its insertion on the inferior patella pole as an avulsion fracture and less commonly in the mid-substance, due relative decrease in the collagen fiber stiffness at the insertion site and the greater tensile strain occurring at the inferior pole insertion fibers than in mid-tendon . Our case had all three factors responsible for poor prognosis as it was 10 months neglected, mid substance tear and post-leprotic. For mid- substance rupture, several techniques involving, simple end to end repair, mobilization of the quadriceps tendon, augmented repairs, autogenous tendon transfers, allografts, synthetic grafts, or combinations of these have been reported with varying success. Repair is done if end-to-end approximation of stump is possible, but it should be reinforced by patello – tibial fixation by s-s wire encirclage or external fixator for protecting the repaired tendon [5,6]. But when end to end approximation of the tendon ends is difficult, as in severely neglected patellar tendon injury, reconstruction with autologous / allo tendon grafts protected by patella-tibial fixation should be done. Two stage procedure are needed in severely neglected injury with proximal migration of patella and practically impossible to retract it distally, initially by migrating the patella distally with help of k-wire traction as by Kelikian, Riarhi & Glazer, Steinman pin by or by illizarov method or freeing quadriceps mechanism & in 2nd stage reconstruction with tendon done[5,6]. Better results are reported with single stage repair with proximal release of scar tissue and Thompson quadriceplasty along in comparison to two stage procedure and traction. But excessive release in single stage techniques should be prevented as it can lead to quadriceps weakness, loss in flexion and avascular necrosis of patella. Augmentation of repair with use of encirlage wire alone, (passing it transosseously or in quadriceps tendon) either in loop or in figure of 8 type, with or without quadriceps lengthening are reported. Moretti B reported a case of bilateral patellar tendon repair by suture anchor and temporarily augmented by circlage wiring . Dietz also reported use of the loop encirclage wire or monofil or PDS cord for augmented repair to patellar tendon in both acute and chronic ruptures. But in both cases secondary re-rupture and muscle weakness was common . To prevent reruptures Casey MT in his series of four cases of neglected rupture of patellar tendon (more than 6 months old) protected the repair with multiple strand of strong circlage wire in a figure of 8 patterns from quadriceps tendon to the tibial tubercle without quadriceps lengthening . Although this use of multiple stand lead to full extension at last follow-up but average flexion was 00 to 1120 only. Thus the augmented repairs combining encirclage wire with suture anchor alone although relieves stress on repair but may lead to considerable complications like, loss of correction and extension can occur with breakage or laxity in the repair, weakness of muscle strength and loss of full flexion can occurs post operatively, stiffness due to immobilization and secondary surgery for the hardware may also be needed. Residual quadriceps and weakness loss of knee flexion may further also require quadriceps lengthening (V-Y lengthening). Ecker lotke & Glazer doubly augmented the repair by transosseous fire fixation as well as by autografts of both semitendonous and gracilius tendon, passing them through holes in patella, and suturing with each other . In more severe and chronic cases, augmented repairs by loop and free tendon grafts (allo or auto) reinforcement are used as Mandelbaum, Bartolozzi, and Carney  used free semitendinous and gracilius graft, fascia lata was used by Siwek and Rao , autogenous hamstring tendon grafts as described by Kelikian, Riashi, and Gleason , contra-lateral Bone tendon Bone (BTB) autograft by Milankov MZ  and achillies tendon by Levis PB  and Falceniero RP  all giving good short term results with decreases need for post op immobilization and good range of motion after 6 months post operatively but patients had 30-40% deficit is quadriceps strength [3,5,11-14]. Stress fractures of tibial are also reported after reconstruction of patellar tendon using achillis tendon bone allograft for chronic injury . Donor site morbidity due to tendon harvesting and risk of disease transmission along with technical difficult with the procedure needing expertise hands are some other potential complications with these procedures. Reinforcement hardware (circlage wire) necessitated second surgical procedure for removal of wire due to breakage and migration of wire leading loss of correction. Among various graft used hamstring grafts are found to be weaker than tendo-achillies and other allograft and as the latter allows earlier and vigorous rehabilitation. If local tissue is not sufficient or inadequate quantity and to overcome complication arising from use of allograft, synthetic graft like mersilene tape by Miskew, dacron grafts as by Levin as well as Levy & carbon fibres are used [16-18]. But these synthetic grafts have risk of host immune reaction and graft rejection. As our case was of 10 months old neglected mid-substance patellar tendon injury, after end to end repair we augmented the stump doubly by transosseous S-S wire reinforcement and further by a denovo procedure, turn-O-flap of quadriceps in single stage, to increase the strength of repair, allow earlier mobilization and preventing secondary re-rupture. This technique avoids use of auto/allo tendon graft preventing donor site morbidity and avoiding the risk of disease transmission. As the quadriceps turn-o-flap strip was thin and small but providing the sufficient strength to protect the repair, post operatively no quadriceps weakness was there and full quadriceps strength was preserved. Further risk of stress tibial fracture or avascular necrosis of patella was also prevented. The procedure was simple and easy not requiring quadriceps tendon lengthening. It gave excellent results with full active extension with no lag with full flexion of knee and attaining anatomic patellar alignment. One limitation of our approach was that there should be possibility of end-to-end approximation of tendon ends and patients must be aware of the expected outcomes before surgery and counseled for need for removal of wire, if it breaks. Chronic patellar tendon rupture are rare injuries but with associated problems in treatment and poor results. Simple procedure of end to end repair with double augmentation of repaired stump by transosseous S-S wire reinforcement and further, turn-O-flap of quadriceps in single stage, to increase the strength of repair, allows earlier mobilization and prevents secondary re-rupture and gives excellent results with full active extension with no lag with full flexion of knee and attaining anatomic patellar alignment. 1. Matava MJ. Patellar tendon ruptures. J Am Acad Orthop Surg.1996;4;287-96. 2. Kannus P, Jozsa L. Histopathological changes preceding spontaneous rupture of a tendon; A controlled study of 891 patients. J bone Joint Surg [Am]1991;73;1507-25. 3. Siwek CW, Rao JP. Ruptures of the extensor mechanism of the knee joint. J Bone Joint Surg [Am] 1981;63:932. 4. Woo, S.; Maynard, J.; Butler, D.; et al. Ligament, tendon, and joint capsule insertions to bone. In: Woo, S.L.Y. ; Buckwalter, J.A., eds. Injury and Repair of the Musculoskeletal Soft Tissues. Park Ridge, IL, American Academy of Orthopaedic Surgeons. 1988, pp. 133–66. 5. Kelikian H, Riashi E, Gleason J. 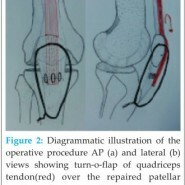 Restoration of quadriceps function in neglected tear of the patellar tendon. Surg Gynecol Obstet 1957; 104:200. 6. Isiklar ZU, Varner KE, Lindsey RW, Bocell JR, Lintner DM. Late reconstruction of patellar ligament ruptures using Ilizarov external fixation. Clin Orthop Relat Res. 1996 Jan;322:174-8. 7. Moretti B, Notarnicola A, Moretti L, Garofalo R, Patella V. Spontaneous bilateral patellar tendon rupture: a case report and review of the literature. Chir Organi Mov. 2008 Jan;91(1):51-5. 8. Dietz SO, Rommens PM, Hessmann MH. Transosseous repair of patellar tendon ruptures. Oper Orthop Traumatol. 2008 Mar;20(1):55-64. 9. Casey MT Jr, Tietjens BR. Neglected ruptures of the patellar tendon. A case series of four patients. Am J Sports Med. 2001 Jul-Aug;29(4):457-60. 10. Ecker ML, Lotke PA, Glazer RM. Late reconstruction of the patellar tendon. J Bone Joint Surg [Am] 1979; 61:884. 11. Mandelbaum BR, Bartolozzi A, Carney B. A systematic approach to reconstruction of neglected tears of the patellar tendon: a case report. Clin Orthop Relat Res 1988; 235:268. 12. Milankov MZ, Miljkovic N, Stankovic M. Reconstruction of chronic patellar tendon rupture with contralateral BTB autograft: a case report. Knee Surg Sports Traumatol Arthrosc. 2007 Dec;15(12):1445-8. 13. Lewis PB, Rue JP, Bach BR Jr. Chronic patellar tendon rupture: surgical reconstruction technique using 2 Achilles tendon allografts. J Knee Surg. 2008 Apr;21(2):130-5. 14. Falconiero RP, Pallis MP. Chronic rupture of a patellar tendon: a technique for reconstruction with Achilles allograft. Arthroscopy. 1996 Oct;12(5):623-6. 15. McNally PD, Marcelli EA. Achilles allograft reconstruction of a chronic patellar tendon rupture. Arthroscopy. 1998 Apr;14(3):340-4. 16. Miskew DBW, Pearson RL, Pankovich AM. Mersilene strip suture in repair of disruptions of the quadriceps and patellar tendons. J Trauma.1980;20:867–72. 17. Levy M, Goldstein J, Rosner M. A method of repair for quadriceps tendon or patellar ligament ruptures without cast immobilization. 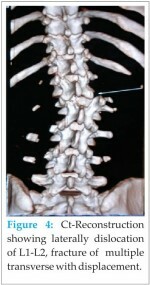 Clin Orthop.1987; 218:297–301. 18. Levin, P. Reconstruction of the patellar tendon using a Dacron graft. Clin Orthop 118:70–72, 1976.